Although Cain Velasquez faces the daunting task of challenging champion Brock Lesnar for his title at UFC 121, the American Kickboxing Academy’s resident heavyweight badass believes he’ll be up to the challenge come October 23rd. “All the hard work that I’ve put in is finally paying off and I’m one step closer to getting what I want,” Velasquez told Fight! Magazine. 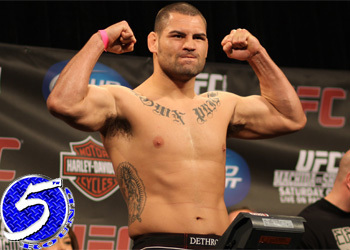 We all got to witness the Mexican-American’s much improved striking game against Antonio Rodrigo Nogueira at UFC 110. Velasquez became the first person to truly put the former UFC and Pride heavyweight champion to sleep, something that not even Fedor Emelianenko did. That resounding victory earned Cain a shot at the crown, but he had to wait because Shane Carwin was already next in line. Velasquez admitted, like most of us who watched UFC 116, he was impressed with Lesnar’s toughness and resiliency in unifying the heavyweight strap. While Lesnar’s outstanding performance has most wondering what – if anything – can be done to stop the 265-pound king, Velasquez believes Brock is no different than the rest of us. “He’s just another man that I have to fight against to get what I want,” Velasquez stated.